As reimbursement levels continue to decrease in traditional pharmacy, many owners are seeking alternative revenue sources to offset profit erosion. One area where some have turned over the past 15 years is specialty pharmacy. Some pharmacies have been very successful, while others regret ever attempting to enter the hypercompetitive specialty space. In retail, we see some occasional higher-cost prescription products flow through the community pharmacy, but unless a pharmacy truly commits to investing in the specialty platform, success will continue to be hit-or-miss. 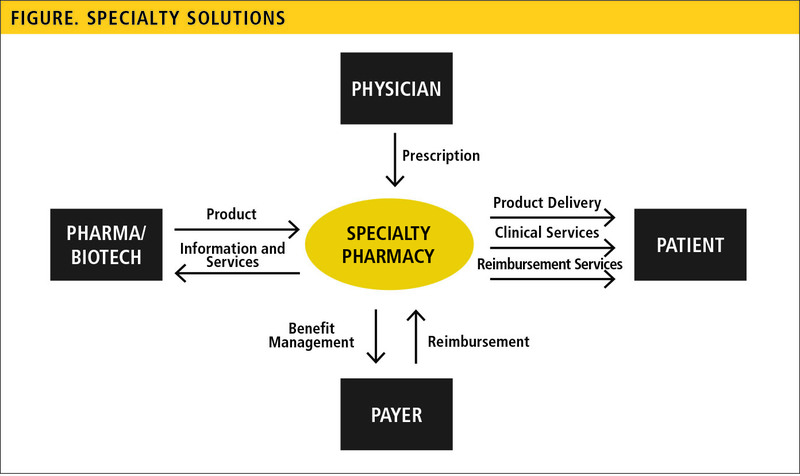 Specialty pharmacy has grown from a notion to a niche industry and is now a major force in health care delivery. There are reasons why pharmacy benefit managers (PBMs), commercial payers, and the government are intensely focusing on specialty products through both network management and reimbursement strategies. Biotech products drive the pharmacy spend, and this will only continue. Because of the rapid and increased spend, payers had to put more controls in place to manage escalating drug costs. These controls can cause many issues for existing specialty pharmacies or those attempting to enter the specialty pharmacy arena. However, the controls can also be an opportunity for stakeholders who understand the specialty space and invest properly. If the entry into the specialty space is not well thought out, it can be very costly. So what are the key areas that a traditional pharmacy needs to focus on to be successful in specialty? First, we need to decide how we define success. Do we want to simply add some specialty products to our current retail business to drive some revenue? Or do we want to create a separate solution in addition to our retail business? The level of investment can vary greatly depending on the desired direction. 1. Does the pharmacy have an information technology (IT) dispensing system that can capture clinical information and report it to a third party? 2. Is the pharmacy accredited by any of the appropriate bodies, such as URAC, the Accreditation Commission for Health Care (ACHC), the National Association of Boards of Pharmacy (NABP), or the Center for Pharmacy Practice Accreditation (CPPA)? 3. Does the pharmacy have an external sales staff? Someone who visits physician offices and clinics on a regular basis, as well as making calls to local or regional payers? 4. Does the pharmacy have a separate space for specialty dispensing and other focused activities? 5. Does the pharmacy have external relationships with other providers such as a hospital, physician offices, clinics, and payers? 6. Is the pharmacy willing to invest? At the end of the day, the decision frequently boils down to 2 primary factors: time and money. If a pharmacy continues to service specialty prescriptions sporadically without a focused plan, we can predict with certainty that success will be short-lived. Payer- and PBM-owned specialty pharmacies will mandate the shift to higher-touch or internally controlled distribution/dispensing solutions. If a pharmacy chooses to fully invest in specialty, there is a long-term opportunity. Let’s discuss some of the marketplace dynamics. Payers, PBMs, and manufacturers currently go through a robust vetting process when choosing which pharmacies can dispense specialty products within their network. Before you can even fill a script, your pharmacy may need to be credentialed. Currently, pharmacies are frequently required to have certain core capabilities before being allowed to dispense a specialty prescription. These credentialing documents can take a week or more to fill out, requiring very specific and intimate lists of information about the pharmacy, ownership structure, and capabilities. The payers, PBMs, and manufacturers all strive for service consistency in their network. This means that a patient could go to any of the credentialed network pharmacies and find similar prequalified services at each pharmacy. This will lead to similar patient experiences, safety standards, and optimized clinical outcomes and also may require significant reporting responsibilities. This reporting goes beyond traditional sales and inventory reporting and may include payer information, co-pay information, secondary/tertiary billing information, clinical data, prescription referral status at the pharmacy, risk evaluation mitigation strategy (REMS), and government data collection/reporting requirements (labs, attestation, training, reporting, counseling, procurement, hub connectivity, hub triage, etc).